Do you relish the prospect of being guided to the next level with a caring, expert coach? Would you like to be part of a friendly class that shares your love for and commitment to bellydance? Would you like to be trained and polished to performance standard? Then our Intermediate Course could be right for you! Once you have trained for at least a year at SMBA Beginner and Improver, or have attended regular Improver level classes for at least a year with your current teacher, you may be ready to join our Intermediate Course. 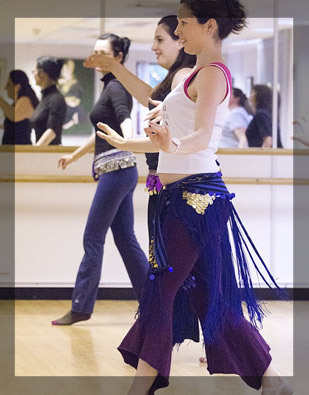 Our step-by-step tuition builds on your existing bellydance training and steadily stretches the skills that you have gained so far. The Intermediate level Course will give you exciting and challenging routines along with thorough tuition to help you master them. Venue: Performing Arts Building, Drama Studio, Reading College, Kings Rd, Reading, RG1 4HJ. Free parking. See here for map. The number 17 bus stop is close by. Curriculum: Our Persian style specialist, coach Natasha, will teach you a stunning classical Persian choreography. Achieve elegant arms and fluid moves with Natasha! * Please note bookings are non-refundable and non-transferable regardless of student circumstances, e.g. holiday and illness. Thank you for understanding.